Don’t be surprised when your mouth starts to water at the mere sight of our catering menu. We designed it to make you do just that. As Atlanta’s most requested barbecue restaurant, we’ve curated a collection of side dishes, entrees and desserts that do more than just satisfy your guests, they delight them. Offering the same exceptional level of culinary genius as our Tucker restaurant, our catering team provides both residents and business owners with affordable dining options for a variety of events. Always fresh and made to order, your dinner and lunch options can include both new delights as well as old favorites. From our award-winning entrees, such as ribs, brisket and pulled pork, to our world-renowned Brunswick stew and our always popular banana pudding, every dish promises tasty thrills for you and your guest. 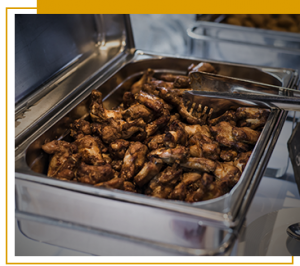 Affordable and delicious, Old Hickory House catering options take the stress and hassle out of your party and event planning.